En son Margotbean en 2019-03-24 20:24:23 tarihinde düzenlenmiştir. Leah is a villager who lives in a small cottage outside Pelican Town. She's one of the twelve characters available to marry. She spends each morning sculpting inside her cottage. Her home opens at 10:00 AM, but players must first acquire two hearts in friendship before being allowed inside. The first time the player enters her cottage an event will be triggered, but only if she is at home at the time. You can give Leah up to two gifts per week (plus one on her birthday), which will raise or lower her friendship with you. Gifts on her birthday (Kış 23) will have 8× effect and show a unique dialogue. "It's the same with people." (arkadaşlık etkisi yok) she agrees and says Oh! yeah, that's absolutely right! "I actually prefer the look of raw, unadultered wood." (arkadaşlık etkisi yok) She says that there's nothing wrong with that and that she thinks there's lots of beauty to be found in raw untouched nature. She goes on to say as a human, she is interested in how we shape and interpret the world around us, she explains this as she is interested in 'art'. "Why don't you have an art show in town?" 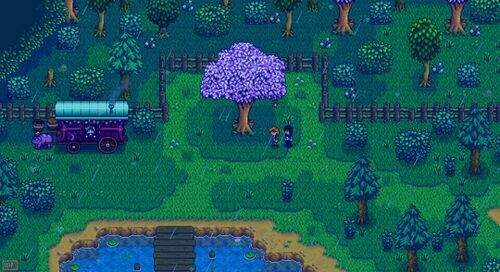 (arkadaşlık etkisi yok) She muses that it could help make Pelican Town a true art destination, but says she'd be crushed if nobody liked her sculptures. She says she'll think about it, and thanks you for stopping by. "Why don't you sell your art on the internet?" (arkadaşlık etkisi yok) She notes that she would need a computer for that, but that they are expensive. She says she'll think about it, and thanks you for stopping by. "No, it had to be done." (arkadaşlık etkisi yok) Leah responds, "You're right... I just wouldn't have been happy back there." "No, and your ex sounds like an idiot." (arkadaşlık etkisi yok) Leah responds, "That's a bit harsh... But yeah, we had different priorities." Leah may randomly request an item at the "Help Wanted" board outside Pierre's General Store. The reward is 3x the item's base value and 150 Friendship points. Bu sayfa son olarak 24 Mart 2019, 20:24 tarihinde güncellenmiştir.